Pitra, C., et al. 2004. Evolution and phylogeny of old world deer. Molecular Phylogenetics and Evolution 33: 880–895. 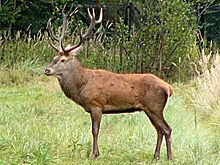 For more multimedia, look at Cervus on Wikimedia Commons. This page was last edited on 23 February 2019, at 02:37.